The surf season is in full swing, the days are shorter, the Christmas decorations are going up, and the temperatures are falling. Tis the season. With 2011 almost over, I wanted to finish this year off with a bang. When Chenay brought up the idea of attempting Bolohead Ridge, I did not hesitate one bit to say yes. 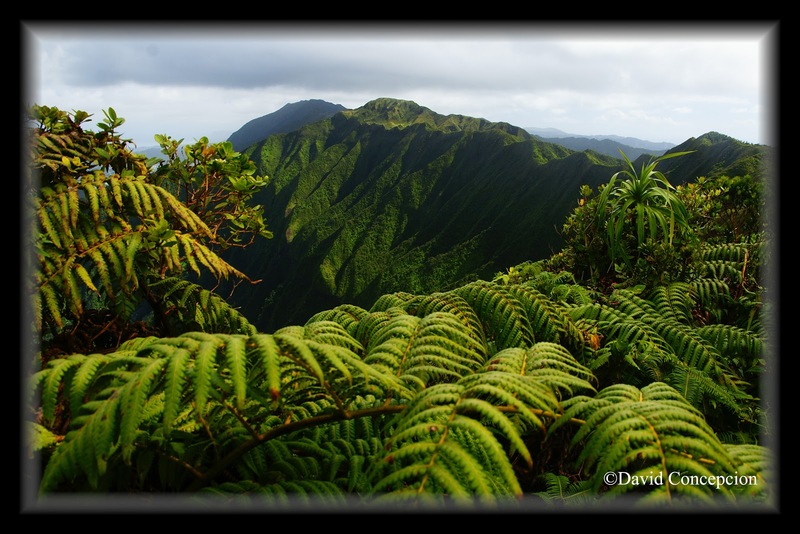 Bolohead is the ridge that is adjacent to the east of the main Wai`anae Ka`ala Trail that is popular to gain the summit of Mt. Ka`ala, the roof of O`ahu, standing at 4,025ft. I have acquired this summit numerous times over the years from the aforementioned trail, and from the Dupont Trail (now permanently closed). I've noticed the ridge to the east of the W-K Trail but paid very little attention to it... that is until Kaleo Lancaster and his crew pioneered the route. They have described it as a goat trail, with no signs of humans ever setting foot on it. "It shouldn't even be a route" was what was written on his write up. The name "Bolohead" was coined by L Steve Rohrmayr to a particular section of the ridge line that features an ominous looking hump that looks like a face with no hair, hence the word "bolohead" meaning "bald head". This hump could probably give Kalihi Saddle's "Witch's Hat" a run for her money. On December 2, 2011, Jeremy, Francis, Chenay, and myself set off on what would be one of the toughest and most mental climbs I've personally done. Also this was the debut of my GoPro Hero 2 camera. I ended up selling my original one and got this one so what a test this would be for it! We set off under a cool damp morning sun, making it ideal conditions, especially for that long walk up the paved road that heads up into the upper reaches of Wai`anae Valley. At some point in the road, we veered off it into the forest. Apparently there's a better way to reach this ridge but we beelined it regardless. 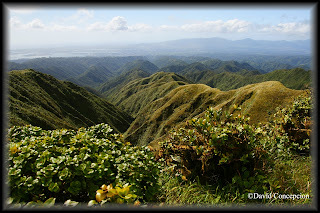 After dropping into a small ravine, we headed up steeply to gain the crest of Bolohead Ridge, but not before intersecting a well trodden trail that happened to be one of the popular hikes in Wai`anae Valley. From here, the climb is steep through a forest. First rock face completed. On to the next, which was the Bolohead feature itself! We followed an eye sore fence line to the base of the Bolohead feature. Francis and I took a small break on a dirt mound while Jeremy and Chenay continued onward towards the climb. As they headed upward, I snapped photos and took video when they appeared to get stuck about halfway up. Things got worse when they haven't made any progress for about 5 minutes. Chenay veered left of a giant boulder while Jeremy went to the right. Eventually Jeremy found a way and was on his way to secure rope to help Chenay finish her climb. Francis and I followed to the base and discovered it extremely difficult. Just about the entire climb is on nothing but loose dirt and dry grass. Beyond another black strap, fastened to a tree, a section between a rocky outcrop and this tree was the most difficult. With none of us making any progress, I called out to Jeremy to bring the rope, followed by another rope, down to our location and after several tries, Francis made contact with the rope and was able to climb the remaining distance to the top. I was up next and found it nearly impossible to climb so I ditched my pack, tied it to the end of the rope. But with the double rope so springy, I could not trust neither of them so Francis put up a third rope and made it up to the top without incident. All three ropes were reeled up, along with my pack. This climb alone took all of us a very long time, about 2 hours! It's that mental! We were standing on the top of the Bolohead feature with a giant tree and it's low lying THICK branches covering the entire top, making for a painful forward progress. In essence, we were "trapped". Descending the makai or the mauka side is exceptionally dangerous, as we were about to find out upon reaching the notch on the mauka side. The ridge line disappeared downward completely. This looked worse than the other side! After the rope was affixed, Jeremy went down first, followed by Chenay. The cliff face is very vertical here and very narrow, with nothing but loose boulders.... ALL of them. This cliff face alone is probably on par with the Kalihi Saddle "Triangle #2" cliff face! Francis made it down safely and I was up next. I took no chances and proceeded to climb down this thing with my bare feet as it proved useful on the "Chimney" on Pali Notches to K1! After a lot of guidance from Francis where to place my feet as climbing down backwards is a must, I made it safely. Another bullet, or should I say fall, dodged! The climb up the other side of the notch is very steep, but not as dangerous as that last one, but the eroded dirt and dry grass remains plentiful. 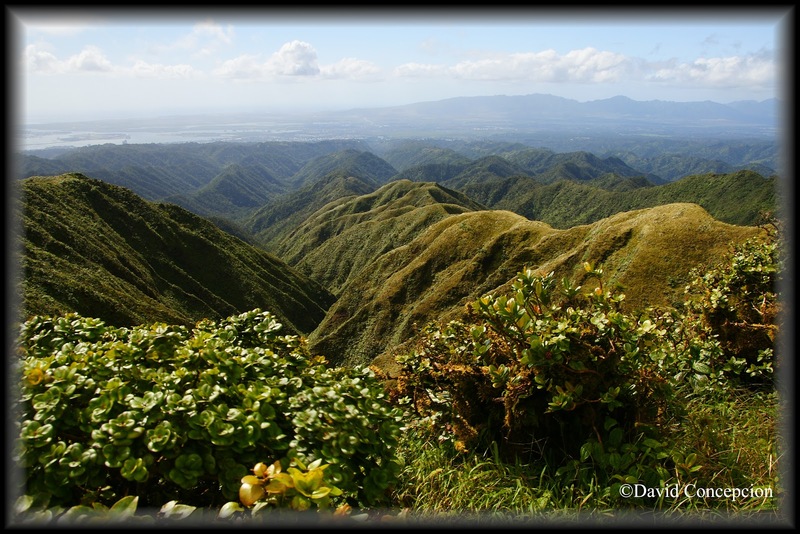 At the top of this climb is a nice grassy lookout that allows a commanding view of the Wai`anae Valley and all of the dangerous features of Bolohead Ridge. However, with time against us, we continued the steep but pleasant climb up a broad ridge with peculiar plants shaped like spiny balloons. If anyone can tell me what these are, that would be awesome! The clouds rolled in and blanketed us for much of the remainder of the climb. Soon that pleasant climb turned into a a taxing and annoying climb through thick uluhe ferns and thorny black berry brushes that lasted nearly an eternity! Ugh! We eventually came across an overhanging gully with a stream flowing through it. We could soon make out the flat plateau of the bog. The next portion of the hike sucked. It sucked really bad. We hated it and I'll keep the description short on the blog. It was muddy, confusing, green, thorny, thorny, and thorny. Sounds about right? I think so because we made not one but TWO complete circles in this mess! Eventually we found the "boardwalk to heaven" and made it to the light, the light of the setting sun as we proceeded down the W-K Trail back to the valley floor and ultimately back to our cars just after nightfall. What a rush! Another hike added to my long list of "Never to do ever again" hikes. I probably received more thorns on this hike alone than all my other hikes combined since the dawn of hiking! What's the reward? McDonald's in a place called human civilization! I would like to start off by wishing every one of you a Happy Thanksgiving! The year is drawing to a close and with that in mind, DGC's Hawaii Hiking Tales is about to turn 1 year old! Time sure flies when we're having fun hiking the majestic mountains of O`ahu. Speaking of mountains, we managed to complete another segment of the Ko'olau summit ridge. A couple weeks prior to this hike, we hiked from Waimano Ridge to Aiea Ridge. On this day, the Ko'olau summit quest continues with Francis, Leo, and myself hiking the summit ridge between Manana Ridge and Waimano Ridge. Manana Ridge is the long 6 mile (one way) roller coastering trail that reaches for the Ko'olau crest from the end of Komo Mai Dr. in Pacific Palisades. Waimano Trail is the super long 7 mile (also one way), but graded CCC trail that starts from the end of Waimano Home Rd by the guard shack. The summit connector is about 2 miles. All of that adds up to roughly 15 miles of trail. While not technical, it is very strenuous, although not as painful as the 18 miler Waimano to Aiea Ridge. Since we were to start on Manana, we were to eliminate the ups and downs early and cruise down Waimano Trail at the end of the day. I remembered to make Waimano the return leg as I learned the hard way going down Aiea Ridge! We set off at around 6-7am under morning clouds with a drizzle here and there. The last time I did Manana Trail was about 3 years ago so memory was a bit vague on this one. We eventually passed by the junction of Waimano Pools/Falls, although the sign marking the junction was gone. We put up some ribbons to mark the junction. To head to the Falls, turn right and head down "Cardiac Hill". To continue to the Ko'olau summit, keep left and also head downward an eroded bank, picking up the trail at the bottom. The vegetation petered out to mostly red dirt and a few sets of stairs and walkways that were installed by Na Ala Hele. Beyond is a grassy field that was probably a remnant of a forest fire. A short while later, we reached the picnic table. This is a good turn around point if you are limited on time. The views towards the Wai`anae Range is splendid. Continuing mauka beyond the table marks the start of roller coaster action on an overgrown trail. Pu'u after pu'u, climb - descent after climb - descent did we inch our way closer to the summit. We developed a technique of resting at the top of each hill, which had flat grassy tops, making it all too convenient for a break. The clouds remained over the summit ridge, but were already beginning to break up under the heating of the morning sun. We reached the "helipad", indicating we were getting somewhat close to the summit ridge, about an hour away. One thing we noticed was a silvery thread running on the crest of the adjacent ridge to our right and heading down into the gulch. You got it, it's another set of that dreaded fence line they are installing on the Ko'olaus to keep out pigs from destroying native plants. But I think the fence is doing more damage by simply being installed. Beyond the helipad, the ridge gets windswept and the views of all the various gulches all around make for a peaceful walk. We reached the the summit at around noon, just in time for lunch. The wind was howling, but the clouds remained high above us and would remain this way for pretty much the whole hike. While this was bad for photos, it provided much needed shade. The views from atop Manana Ridge is beautiful with a commanding view of the windward coast of He`eia Pier, Waikane, and Hakipu`u towards the north and Kaneohe further south. Pu'u Ohulehule and Chinaman's Hat was also visible. After filling up our stomachs, we began plowing through the thick summit foliage towards the terminus of Waimano Ridge. The three of us all opted to wear shorts and we would pay the price dearly by the time we reached Waimano Trail. After two or three humps, we reached a bowl shaped grassy pu'u. This is Pu'u Eleao and it makes for an excellent camp spot. The bowl shape makes it even better, shielding you from the windward trades. We spent some time here enjoying it like little kids hopping up and down for joy. I even let gravity take me and plopped flat on my back onto the soft grass! Food for the soul and mind. On the other side of the grassy pu'u lies a grand view of Waihe`e Valley and the amphitheater shape of the Ko'olau pali surrounding it. Looking leeward were the countless ridges all running parallel to each other. I couldn't help but spending considerable time here taking photos. Just past Eleao is a tricky part where one can easily get astray. Be careful here. There is an obscure junction with the "obvious" trail leading away from the crest along a smooth and level grassy ridge which heads down leeward somewhere between Manana and Waimano ridges. One can easily get disoriented here if hiking in the clouds! Actually, turn left off the "grassy ridge" and head downwards to pick up the summit crest. More ups and downs were the factor for the last mile or so until we finally had the small grassy clearing with the brown "End of Trail" sign in our sights on the last hump. The final obstacle was a nasty washout with the ridge even overhanging a bit, ready to fall at any given moment. Use caution here and you'll cross it easily. The Waimano summit lies nudged between two humps. After a final descent past another small eroded section and we were there. Our legs were covered in red angry slashes. Not wanting to waste time, we proceeded down the Waimano Trail, still overgrown with uluhe but graded. It was muddy and slippery and even took a nasty spill when I lost my footing when I tried so hard to avoid mud puddles. Into the mud puddle I go, the weight of my pack acting as a counterweight, thus propelling me into a roll over that ended up getting me muddy on my entire right side of my body! Other than that, it was a very long and uneventful trail. So long that we were still on it by the time the sun set. After crossing the stream beyond the switchbacks, we put on our headlamps and finished the remaining 2 or so miles in the dark. We reached the car by 6:45pm and headed to the nearest McDonald's for post hike refreshments. I highly recommend doing this route with Waimano Trail as your return leg, or you will be exhausted going down Manana with all those ups and downs as I was going up Waimano and down Aiea Ridge!